Who said coloring was for kids only? 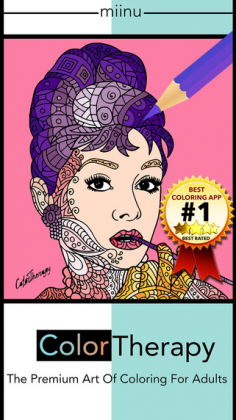 For the past week PocketMeta has been exploring the mobile coloring apps, and quite a few apps have the adult audience in mind. Not to mention if you want to show some productive, creative mobile games to your youngsters. 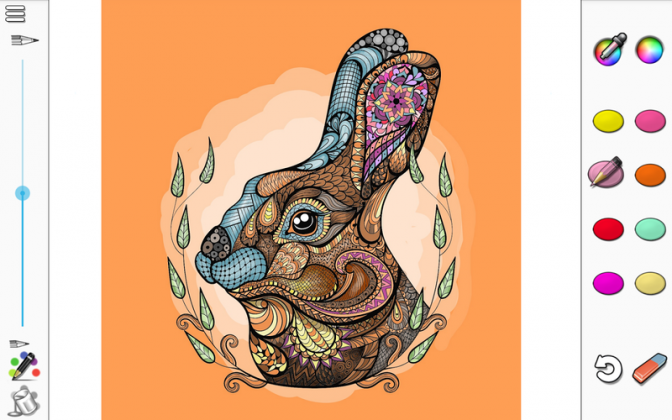 These apps offer extensive palettes, some free, some paid, quite a lot of templates to color in many categories – animals, mandalas, world masterpieces. You can have a blast of a good time toying with these fun and sometimes advanced apps on your mobile, and here are our top picks as of now. The only downside most of these apps have in common is the similar titles, which make it difficult to tell one from the other immediately. Oh, and don’t get misled by the word “adult” in many of these apps. There is no age-sensitive content in any of them, unless you consider celebrity faces age-inappropriate. Why, for one, children should not be exposed to the images of Donald Trump until puberty, or even later. One of the first apps that pop up on the search results page is Coloring, and we encourage you to check it out for its sheer volume of the available pictures. There are over 90 professional, beautiful images and one of the most extensive palettes you will find for free on the play store. That bright humming bird has become one of the most recognizable images of the coloring apps, and the collection of the animal pictures is amazing. The free app has nine coloring packs, with some three pictures available for free in each. You can’t choose the ones you want for free – they are pre-defined. The categories include animals, floral patterns, sea life, mandalas, birds, and festive. You can zoom in to see the tiniest bits of an image; you can also switch between the automatic filling in or paint by swiping your finger across the large areas in daring strokes (you can choose the brush width, too). There is an undo button and an eraser. The default color palette includes 80 colors, a color wheel to further adjust the hue and separate rulers to choose the intensity of a color and its transparency. The best part is the free version differs from the paid version only in the amount of the images while the colors and functionality is the same. There are no ads or the time limit. Finally, you can adjust the UI layout depending on whether you’re left- or right-handed. 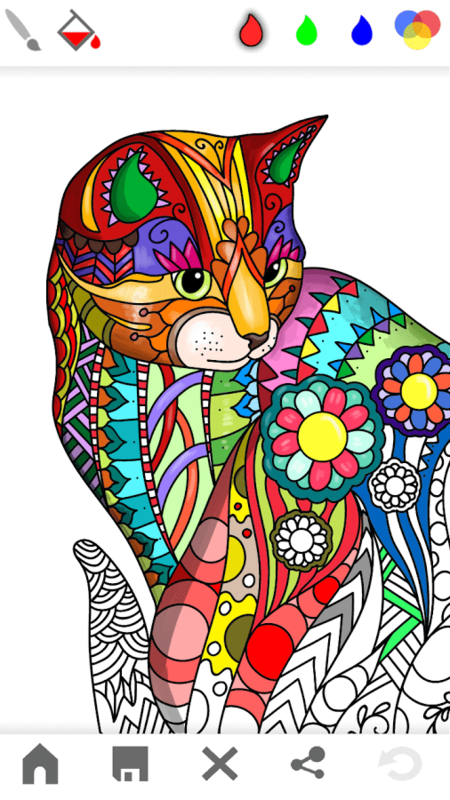 Colorfy is a must-try coloring app, and perhaps the smoothest and most responsive. The library includes a cool selection of pictures in many categories, and it is exactly this selection that can become the decisive feature for many. Florals, animals, famous art, messages, cats, gardens, patterns, mandalas, oriental, exotic, festive, and featured artists’ collections all have sub-volumes, with free and paid pictures. 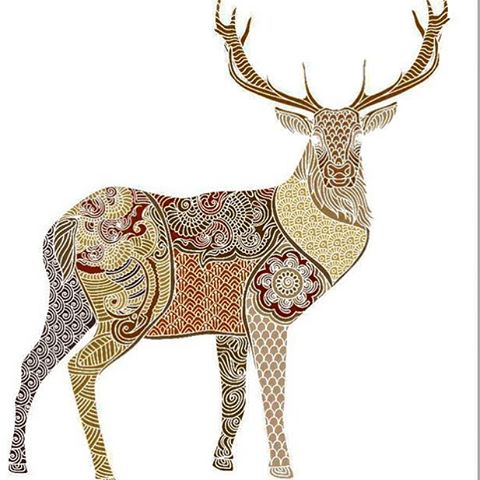 My favorite part is the selection of the geometric patterns and the famous paintings that offer a fine contrast to the otherwise standard floral-mandala-animals gallery. Another neat feature is you can apply different filters to a picture when it’s finished – paper, leather, wood, brush strokes, brick wall, jeans, and wool. Sharing is a tap away, too. The color palettes are many, some are free, some are paid. You also get one additional palette per day fro free, and you can vote which color gets to be the palette of the choice for the next day. The patterns selection is all free, and you’d be amazed what people do with these grids and cubes! 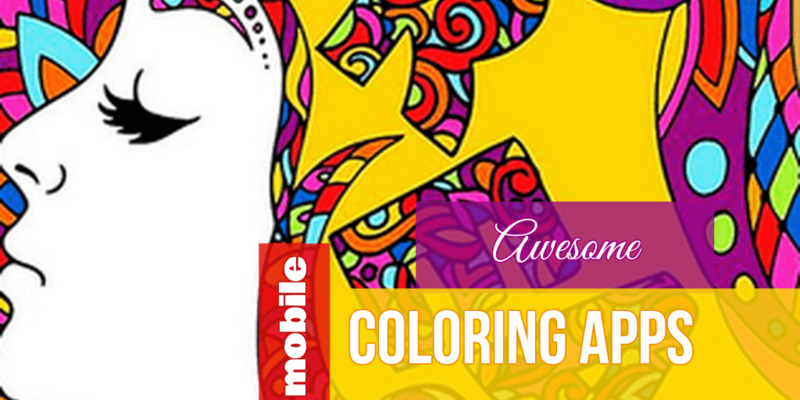 All in all, Colorfy is the right app to unleash an artist in you. The paid content becomes available via a subscription model that comes rather pricey – $3 per week, $8 per month and $40 per year. You can stick with the free pictures, but buy additional palettes via IAPs, too. It would make more sense to make the premium version a one-time purchase instead of a subscription-based service. However, its free version runs offline and has no ads; its biggest limitation being the palettes. A gallery of user art will give you some fresh ideas and inspiration; users can also like each other’s works. Overall, it’s a very fine app that gets updated regularly, but it could use a couple more categories in styles other than cute animals and florals. Oh, and you can create your own custom message cards, choosing the font, the background and coloring them, but the backgrounds choice is quite limited and always too dense. ColorDiary is a good coloring app for grown-ups, if you are looking for a free app to kill some time. There are some very nice and quite unique pictures, but they are not organized into categories and are somewhat difficult to navigate when choosing, especially considering they are different in themes. 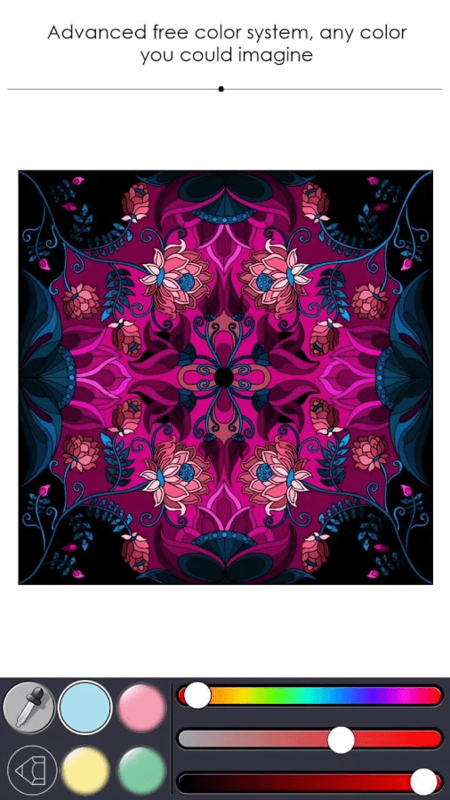 These are mostly mandalas, animals and floral patterns, hearts, and a few abstract and kaleidoscope pictures, some symbolic and can make for awesome and unique avatars. The best part? 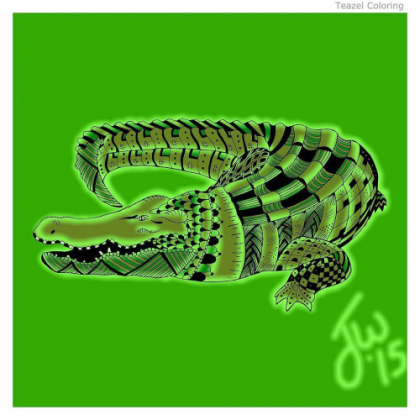 It’s free, and whatever you see you can color for free, while all the available colors are also free, with a few new ones appearing every once in a while. The intuitive and minimalist UI and responsiveness make it a go-to relaxation app for the creative hearts. 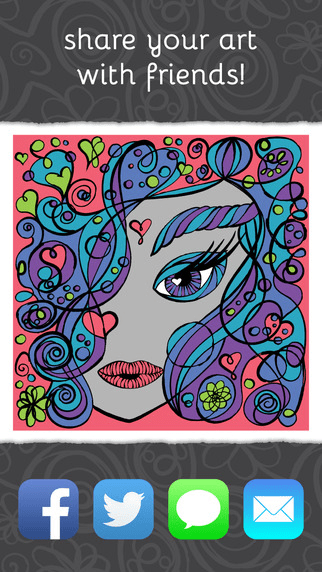 MOMI Coloring is a fun alternative to the above-mentioned apps mostly because of its selection of the pictures, all free. Then, there is a Shop with four sub-departments containing free and paid pictures of flowers, portraits, architecture and rooms, and abstract shapes, patterns, mosaic, festive and all that jazz that does not fit into the other three categories. The choice of the free pictures is really impressive, especially if you fancy something non-floral, and some 90% of the pictures are free, indeed. Cars, musical instruments, shoes and bags, iPhone screens, squared grids, Esher-esque totally Monument Valley layouts, food, jewelry, churches, towns, bedrooms, anime characters – Momi is a blast. The color palette may seem limited at first – 9 bold colors with 8 hues per each, but if you tap the multicolored pencil at the bottom right corner you will find three gradients and a color picker. Hence, the variety depends on you masterfully picking the subtle hues. Share, like, draw inspiration from public galleries. Download more free stuff – after registration that requires your email. You can even skip the gender. Overall, Momi is a hidden gem we encourage you to check out. Adult Coloring Book is one of the best coloring apps on Android, featuring several galleries with free and paid pictures – animal kingdom, mandala world, Zen spirit, pixel art, secret garden, and hearts. Some galleries, usually the ones that go by 2 and 3 as in Animal Kingdom 3 or Mandala World 2, are entirely premium, while some are mostly free. The latter include very nice, if short, collection of animal pictures, with a dolphin, a tiger face, a mighty bear, an Indian elephant, a tortoise, a gecko, some butterflies, an animal I can’t identify and a couple of fiendish cats. Pixel art gives you a blank grid of three different calibers to create a mosaic you used to draw at the back of your Math notebook. The pictures you are working with are kept in My Works for quick access. The palettes are fine, with the free ones including Essential with 24 bold colors, Dynamic with 24 vivid (I call it toxic) colors, Classical with another 24 matte colors. The premium palettes are Serenity with 24 cold-ish shades of blue and purple, Light with 24 hues of cold pink and green, and an Infinite palette that lets you edit the colors manually. Sharing images, resetting or canceling the last few edits are easily accessible. Zooming, saving different versions, picking colors is easy. The free app is ad-supported, and there is an IAP that removes ads. Overall, it’s a fine app that could use a little more diversity and new pictures in its free edition. Mandala is dubbed as if it only contained the mandalas to color, but in fact it offers the animals, flowers, oriental-themed and faces pictures to color. Some are wonderfully low-poly, others are grotesque and reminiscent of Dali – you get it right, the portraits are my favorite. There is even one that looks like Sia, the She Wolf and Elastic Heart singer. It is ad-supported. There are five color palettes – basic, Spring, Summer, Autumn and Winter, with 25 colors in each; a brush with three sizes and a fill in bucket. It’s hands-down a must-have app, but if you forget to tap the Save button, your hard work is lost. Should auto-save. Other than that, it’s a great alternative to Colorfy and gives you lots of stuff for free. iOS users who want a little more than mandalas and florals should check out the freemium PrismJoy, featuring cowboy boots, artistic faces and cupcakes in addition to the standard categories like animals and flowers. There are some basic bold colors available for free, and much more via IAPs – all for $1.99 one-time purchase. The IAPs also include additional volumes for the said galleries, a diversity of skin tones, an analogous gradients color palette and a few more custom palettes. If you buy them separately, they come at reasonable $0.99. The app features a 20x zoom, and sharing buttons. Another iOS-exclusive app on the list is Color Therapy, sorry Android folks; one of its screenshots is on our featured image. 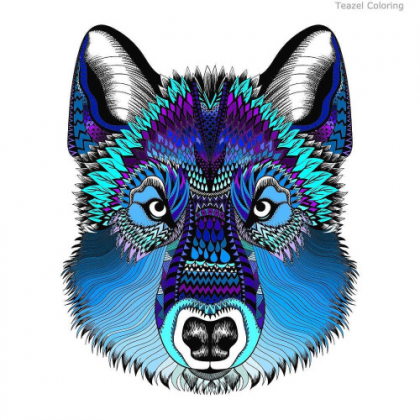 We loved Color Therapy for its selection of amazing, sometimes unique coloring pages, with an overall of 250 and counting pictures. Of course, there are flowers and trees, blossom and twig, exotic and animals, with subcategories for cats, butterflies, dogs, fish, birds, dinosaur and wild animals. 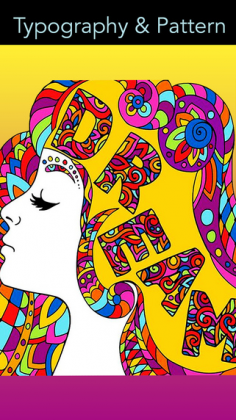 Horoscope signs, typography, patterns (origami, tribal, abstract), Gothic art, fairies, Japanese Zentangles, mandalas and, attention!, portraits of celebrities, including some of the US political characters. The free palettes are added daily. The paid palettes are $1.99 each, or $5.99 in bulk. Awesome filters will let you adjust the background and even put your name on the image before sharing. 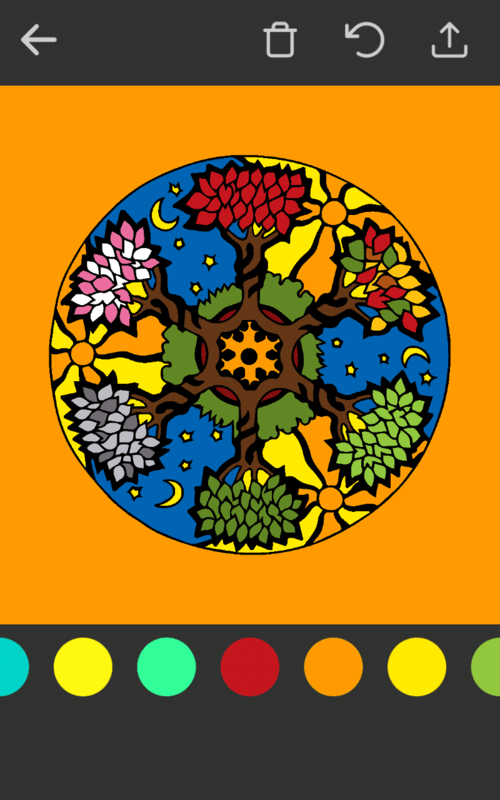 All in all, it’s a wonderful app that does not limit itself to mandalas and flowers only, and it’s a worthy purchase if you choose to go premium. We so want it ported to Android! 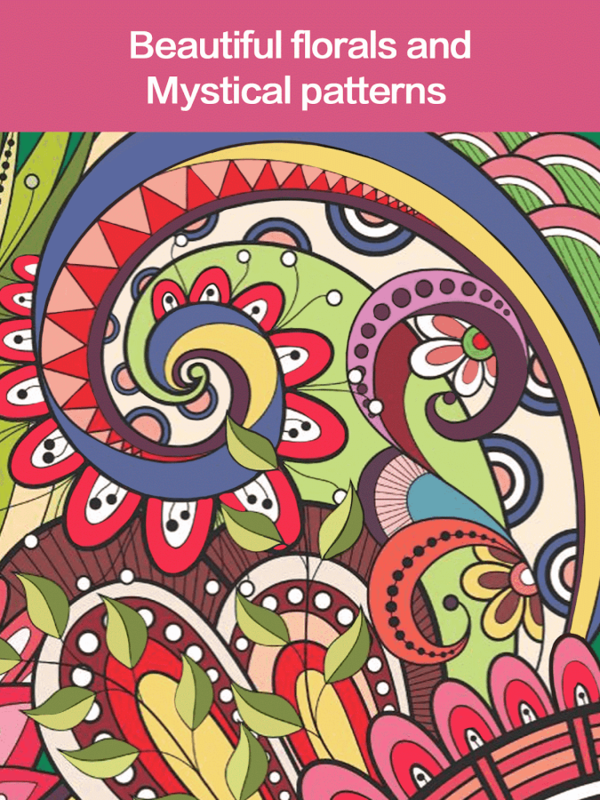 Another great and quite a unique coloring app that’s iOS-only, Pigment immitates, and quite realistically, the true colored pencils offering 200+ hand-drawn, amazing illustrations that stand from the crowd of the generic mandalas. There are 8 different pencil types, brushes, markers and an extensive palette. What some apps offer as an optional filter (brush strokes effect, or the brick wall) Pigment has enabled by default, and your strokes translate into the realistic pencil or paint brush strokes on screen. 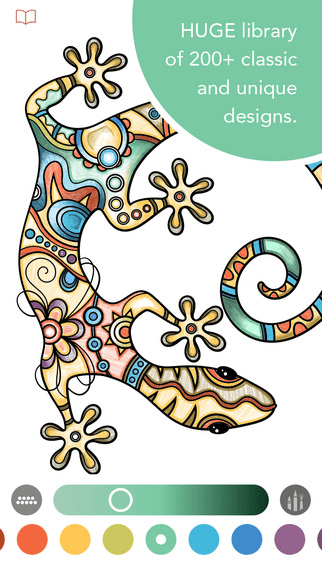 The coloring tools include pencils, markers, brushes, fill, airbrush, circle brush, radial and linear gradients. Pigment supports finger, third-party stylus and Apple Pencil. The free version puts a watermark on the images you share while the premium subscription removes it, and gives you access to all the images library updated daily. Premium users can also save hi-res images. The free app begins with a 7-day free trial of the premium features, you don’t get charged, but in case you do not wish to opt in for the premium membership, you need to cancel the future payment (which is weekly by default) in your iTunes account. Otherwise, you will be charged automatically. The payment structure is a letdown of the app, especially considering it’s subscription-based, and costs $1.99 per week, $4.99 per month or $24.99 per year. Another downside is that you can’t save a custom shade even if you’re a premium user. Considering it’s a new app, it is nonetheless worth a shot, a beautiful and unique experience it is. Ok, last verse same as first – florals, how can you go without them? 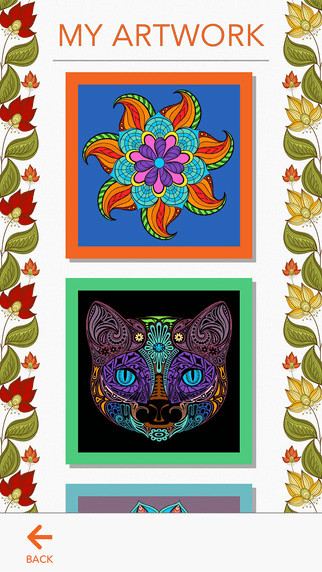 Animals, patterns, mandalas and festive galleries come free of charge, with the only IAP of $2.99 to remove the ads. It does not require subscription, and offers wonderful palettes arranged harmoniously, so that even the noobs can arrange beautiful color-harmonious pictures. A very nice selection of pictures, colors and accessible UI make it a great alternative to the mainstream apps. 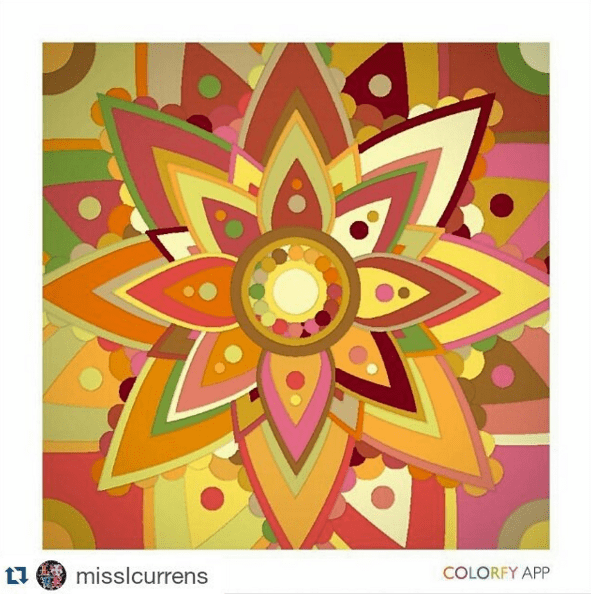 Now that you have our list, share your favorite coloring apps with us! We simply love how relaxing and meditative they are. Most importantly, they let you create something you are proud of, and worth sharing with your friends. Try it, it’s amazing.